Stingray's coffin is brought into a room. Meanwhile Dylan sits huddled, shaking and breathless on the floor of a trashed Scarlet Bar. Janelle and Janae unpack crockery from a box. Janelle fights back tears and Janae puts a supportive arm around her. Zeke hugs Audrey until Rachel shoos her away. Toadie joins them as Rachel uses a clothes brush to rid her brother's suit of dog hair. A wreath is placed upon Stingray's coffin. Sky can't remember which one of Kerry's hats Stingray liked the best. Bree tells Janae that Dwayne might make it to the funeral but Brendan can't get there until tonight. JANAE: Mum feels really bad about it. BREE: Yeah, I know. She was crying to Sarge about it last night. Candles are lit on either side of the coffin. The phone rings. Bree thinks it could be Lyn but Janelle instructs them not to answer. Steiger appears, asking if anyone's seen Dylan; he's not in his room. Boyd opens up to the place in a state and Dylan sitting with his knees under his chin, head down. Boyd pulls out of sight and calls someone on his mobile. Janae thanks Boyd for calling her and relays the news to Steiger and Kim. Steiger grabs his keys but Kim asks him to let him do it. KIM: I won't do a runner. He needs me. Luckily Lou and Harold are there to locate Stingray's favourite hat; a sheepskin number that he thought made Kerry look like a mushroom. SKY: That's right. He called her ‘my little shitake'. Harold wasn't too fond of the name – it was the way Stinger pronounced it. Sky smiles at her baby. 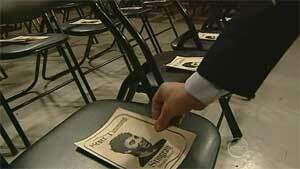 Copies of the order of service are placed on each seat. There's a smiling photo of Stingray on each one. As they head for the door Rachel hands Toadie and Zeke some handkerchiefs and Toadie reminds her that Karl and Susan left *him* in charge. He asks if she has some but she says she'll be fine. Nonetheless Toadie takes some extra, telling her they're just in case he runs out. Lou and Harold support a sombre Sky as they leave Kerry's room. Harold assures her she'll be okay. 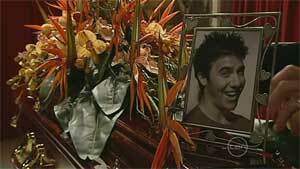 A framed smiling photo of Stingray is placed on his coffin. Steiger asks Janelle if she's ready but she shakes her head and starts to cry. STEIGER: C'mon, sweetheart; I've got you. Kim arrives and rushes over to Dylan. He helps his son to his feet as Dylan tells him he can't go on like this, letting everyone down. Kim tells him that won't happen. He knows that no matter how bad Dylan feels he won't let his mum and sisters go through this alone. Dylan, tearful, can barely stand and Kim holds him up. KIM: Come on, son. Let's go and say goodbye to your brother. Dylan leans on his father as Kim helps him out of the wrecked Scarlet Bar. Janelle walks up to the coffin and stands at it for a moment, biting back tears, before Steiger helps her to the seating area. Rachel, Zeke and Toadie arrived. Rachel starts biting her nail so Toadie hands her a hankie. Harold, Sky and Kerry sit alongside Dylan and Kim. Sky asks Dylan if he's going to say hi to Kerry; they haven't seen him for a while. Dylan says he doesn't want Kerry to see him like this and Sky almost scolds him. SKY: Would you please look at her? Because, I swear to God, you'll see him. He's alive in her. Dylan doesn't for a moment but then he turns around, glances at Kerry, and grasps onto Sky's hand. The funeral director appears, signalling the start of the ceremony. Boyd's tidying up the bar. Glenn appears and is surprised he isn't at the funeral. Boyd admits he can't deal with it right now and Glenn again reminds him that she's there to support him – he has to share it with someone he loves. Boyd, deep in thought, agrees with her, and tells her he has to go but will meet her for lunch. He dashes off, leaving her. Janae is speaking about watching TV with Stingray. He couldn't sit still and always ruined the ending! The mourners laugh as Boyd appears. Janae grows serious. JANAE: But, what's worse, is watching TV without him. All of a sudden there's this big, gaping hole in our family. JANAE: No one to make sure we don't go to bed mad at each other. No one to make you really feel good about yourself. JANAE: Y'know maybe if we were better prepared for this we would've hugged him tighter or just laughed harder at his jokes – they were lame! JANAE: But what I do know for sure is that we couldn't have loved him any more than we did. Outside Boyd sits in his car. Janae appears and he starts the engine but she runs over to him, telling him to wait. He apologises and says he's leaving but Janae reaches through the open window to turn the engine off; he has a right to stay. Boyd reminds her how Stingray hated him for what he did to her but Janae points out that it's small stuff that they would've got past like they always did. Stinger would've wanted him there. She opens the car door. JANAE: I want you here too. She offers her hand and he takes it, getting out. Inside Bree tells the mourners that every day was a wild adventure to Scotty. Like a little kid he always presumed the best in people and that's pretty special. Janae and Boyd return and sit up the back. BREE: It took falling in love with Sky and Kerry for him to realise he was just fine to begin with. Sky looks to her granddad. BREE: They helped him to realise that being different to everybody else was what made him so wonderful. A tearful Sky kisses Kerry. BREE: We love you, Scotty. It's now Dylan's turn to speak but he won't move so Sky gets to her feet. SKY: But, you know what, I'm not going to have to embellish on one single word. SKY: Stingray saved her life. He was my best friend and he'll never *ever* be replaced. Outside Zeke finds Rachel and she tells him to go back inside – she'll be okay – but he sits down with her anyway. She tells him Stingray was her first boyfriend and she's never loved anyone like she loved him. She doesn't think she'll ever find anyone who compares with him. ZEKE: Not in a million years. He tells her not to compare them then. Rachel then pulls out a piece of notepaper, asking if he's ready, and Zeke does the same. A while later Rachel and Zeke are making the gathered crowd chuckle with their poem. He hated his veggies and wouldn't eat greens. He did ace stunts and was a hit on Nut-Off. He had a tatt on his bum named after a hamster. Hufter, Spiggin', Massa and Cringo. LOU: Yeah. I used shonked-off just last week! Toadie laughs as he recalls not knowing anyone else who could inhale a chilli milkshake through their nose. Dylan listens to this, his face becoming angry. As everyone laughs Boyd gets to his feet. BOYD: You know if you measured someone by the size of their heart Stinger was a giant. I'm sorry, mate. I let you down. Dylan springs up, enraged, screaming at Boyd not to call Stingray his mate; Stinger was worth a hundred of him! Kim pulls him back and asks him if this is really what he wants his brother's funeral to be remembered for. Dylan drops, exhausted, into his chair. Boyd finds Glenn in the office and tells her about going to the funeral. However from now on it's all about them. Glenn doesn't want to talk about them – she's here with her bags all packed. She knows it's bad timing but someone had to pull the plug. 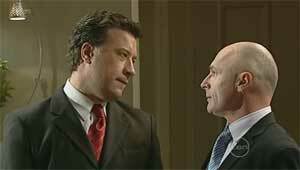 Boyd tries to apologise but she tells him not to. All she asks is for him not to use Max's disappearance as an excuse for how he treated her and Janae. Boyd agrees - there's no excuse. Glenn hopes Janae won't take him back right away as he doesn't deserve unconditional love right now. GLENN: Thanks for saving my life. She leaves and Boyd ponders things. The Timmins, Bishops/Mangels and Lou return to find cars parked in the street and lots of skateboarders. Sky tells Janelle that she invited them; Scotty's funeral only had close family and friends and they needed to do something. Janelle muses that she doesn't know any of them and Sky starts to say she'll get them to leave but Janelle is just proud they were all Scotty's mates. Steiger asks Bree and Janae if they've seen Kim and Janae thinks he's done a runner. Steiger thinks he'll show but Bree knows Steiger's going to arrest her dad once this is all over. Steiger says it isn't over till it's over – you won't get chased if you don't run. Janelle thanks some random skaters for coming. Zeke and Rachel present her with a tree to commemorate Stingray. Janelle thanks them, saying it's so thoughtful. Dylan returns, without Kim, and won't answer Steiger when he asks him where his dad is. Janelle, Steiger, Janae and Bree lead the mourners to number 26's back yard and the planting of Scotty's tree. Skateboarders stand on either side of the driveway, holding their boards so they're touching the ground in front of them. As the Timmins etc walk up the driveway the skaters hit the boards off the ground, making their own unique mark of respect. Everyone watches Toadie dig but Dylan is frustrated with his lack of progress and pushes his cousin aside. He uses an axe to break away at the earth, hitting the ground furiously. Janelle, distressed, walks away. Later on Sky shows Janae a tattoo on her back – it reads ‘Stingray' and yes, it's for real. Janae thinks Stingray would've loved it. Harold begins to walk over and Janae tells Sky to watch out but, to Sky's surprise, Harold adds that he, too, thinks Stinger would've loved it! Dylan is still hacking away at the ground when Lou tells him to settle down and takes over. Dylan reminds Steiger that he said he'd help him and Steiger says he will. Dylan is losing it and Steiger had said he wouldn't let it happen – he has to lock him up. Steiger doesn't want to, not after everything. Kim appears and Steiger tells Dylan to hold tight – help is on the way. Kim and Steiger go inside. Janelle thanks everyone for coming. She was surprised at so many turning up but that was silly of her – Scotty made friends everywhere he went. JANELLE: His happiness was…catching. Now we have to learn how to keep going without him. Kim tells Steiger that he stayed back at the crematorium to spend a few final minutes with Scotty. Steiger just looks at him and Kim turns around, offering his hands to be cuffed but Steiger tells him to relax; he wants to know what he's been working as since he went away. Kim tells him he's been working on a tourist boat in Port Douglas and yes, he's been keeping his nose clean. Again Kim offers his wrists. STEIGER: At ease, Kim. I got other plans for you. After commercials Steiger stands alongside Kim and Dylan, making sure they're both okay before he leaves them to it. Kim tells Dylan that he's heading back up north and Dylan's coming with him. Dylan demands to know why and Kim says it' because of the tone in his voice and look in his eye. KIM: You've got to get your head together, son. Dylan won't leave Kerry or Sky but Kim reminds him he's been avoiding them. Dylan knows fine well what'll happen if he stays here. Dylan angrily says he doesn't cut and run. Kim agrees – he'll go away and get his head together then return to Erinsborough and be the father to Kerry that Kim never was to his kids. Dylan is unsure; it'll take some time. Kim will help. DYLAN: I can't cry, Dad. I can't laugh about him. I can't share happy stories like everyone else. I can't do ANYTHING! I'm just so angry, every minute of the day. Kim assures him he'll get through it. But if he stays here and someone gets hurt he'll go to prison. Janelle will lose two boys and no one wants that. KIM: You've gotta trust me, mate. Let me do this one good thing. Let me be your dad. The tree has been planted. Dylan walks over to Janelle and tells her he loves her. Janelle, pleased, pulls him into a hug, and promises him they'll be okay. Dylan apologises to Bree and Janae for his behaviour. Janae half-laughs through tears. Dylan goes over to Sky and touches Kerry's face. He tells Sky not to hate him and Sky assures him that's not possible. SKY: We love you. (looking to Kerry) Don't we, miss? We love your silly daddy. Dylan kisses Sky's cheek and gives her and Kerry a smiling photo of himself and Stingray. Bree realises what is happening and rushes into his path. BREE: D'ya have to go? DYLAN: I am so sorry, Smidge. He promises her he'll be back the second he's better. He kisses her forehead and walks away. Janelle walks over to the tree with a watering can and her family and friends gather round to watch.